When you love your fur baby like family, you’ll always want the best for him or her. Dogs become our best friends, devoted protectors, playmates, motivators, and so much more. And like us, dogs can suffer from emotional and physical ailments that can seriously interfere with their quality of life. Because of this, many people are wondering about the effective and safe use of essential oils and dogs. They help us humans out so much; could they help dogs, too? They sure can! How can EOs help our beloved doggy pals? First, it is critical to understand what an essential oil and how powerful these highly concentrated and volatile compounds are. Please head over to this wonderful video series if you need to learn about these plant substances and how they can affect just about every system of the human body. Since humans and dogs obviously have very different bodies, we do not react to essential oils in the same way. This is super important to consider before you use your EOs for, or even near, your dog. Just because you can handle a certain EO and really enjoy it, doesn’t mean your dog will. Actually, some oils can be very dangerous to dogs, especially when not diluted properly. But we’ll get into that shortly. What is good to know is that when used correctly, essential oils can help address a variety of health concerns for your dog, including skin issues and emotional struggles, like anxiety. Now let’s learn about doggy anatomy! It’s common knowledge that dogs have a much better sense of smell than humans. But sometimes, that’s really difficult to translate into how that affects their day-to-day behaviors, desires, and needs. Please take about four minutes to check out this amazing video by TEDEd, which gives a perfect breakdown on the power of a dog’s sense of smell. This information alone may get you thinking about how you use your essential oils and how it may be affecting your dog—even if that isn’t your intention. 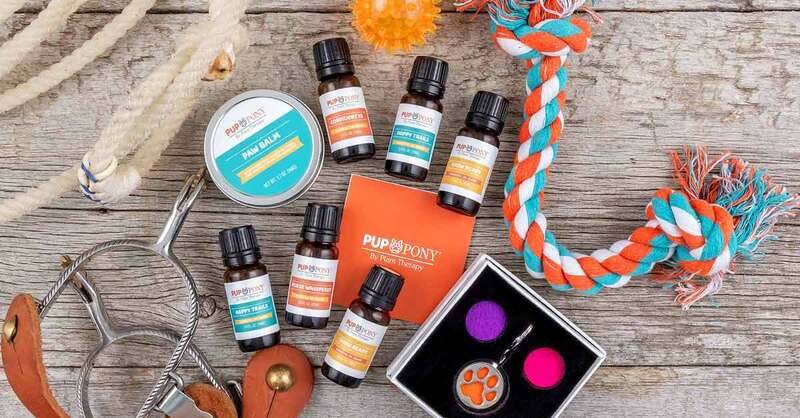 If you’re interested in supporting your dog with aromatherapy, you might be wondering how to start. Oftentimes, when introducing essential oils to a human friend, you’ll just pass them the bottle and have them take a whiff. But that is definitely not the correct approach to introducing an oil to a dog. Inhaling straight from the bottle will be too overwhelming due to their sophisticated olfactory system and can cause both physical and emotional distress. Instead, we want to focus on first creating a positive association with the scent of the essential oil or EO blend you have in mind. To do this, let’s run through a hypothetical situation. Say your pooch is suffering from some general nervousness and you would like a natural way to help calm them down. You may simply choose the tried and true EO for calming, Lavender, which is also a safe choice for dogs. First, you’ll dilute the Lavender to the recommended amount based on your dog’s weight (we will go over this a little further down). Then rub that on your palms and present your palms to your dog. Do not force your palms on him or her, just simply present them to your dog and see if he or she is interested and see what the reaction is. If your dog responds well to the scent, continue doing this for a few days. That way, they will begin to associate that lovely Lavender aroma with their most favorite person—you! Increase this positive association by including the aroma into activities your dog enjoys doing, like going for a walk, playing fetch, cuddling on the couch, or anything else! Once your buddy has given his or her A-OK to the essential oil, you can move on to applying it topically or using it aromatically. Some signs of acceptance include your dog showing an interest in the oil, a willingness to continue inhalation of the oil, visible relaxation, and licking the oil. While we would never recommend allowing your dog to intentionally ingest essential oils, the very diluted amount on your palms will not cause harm if licked a bit. Some signs of an aversion to an oil include walking away from the aroma, an aggressive emotional response, pacing, panting, turning head away, whining or whimpering, or showing respiratory distress. All dogs are different and these lists are not all-inclusive. Basically, you are looking for out-of-the-ordinary behaviors from your dog to help determine if he or she is accepting or rejecting the essential oil. DON’T present undiluted essential oils to your dog. DO apply the oil to yourself for the first few days before applying to your dog. DON’T force essential oils on your dog if they show aversion. This may lead to a negative emotional reaction. DO be familiar with your pet’s current health issues and speak with a veterinarian to help decide if using EOs is the right choice. DON’T add essential oils to your dog’s food or water. DON’T use on puppies under 10 weeks old. Once a positive scent connection has been established, you can start diffusing and using topically! How to diffuse for your furry friend. When actively diffusing, we recommend using an ultrasonic type of diffuser (like the NovaFuse, UltraFuse, & AromaFuse). Use 1-2 drops per 100 mL of water and begin diffusing for 5 to 10 minutes every few hours. 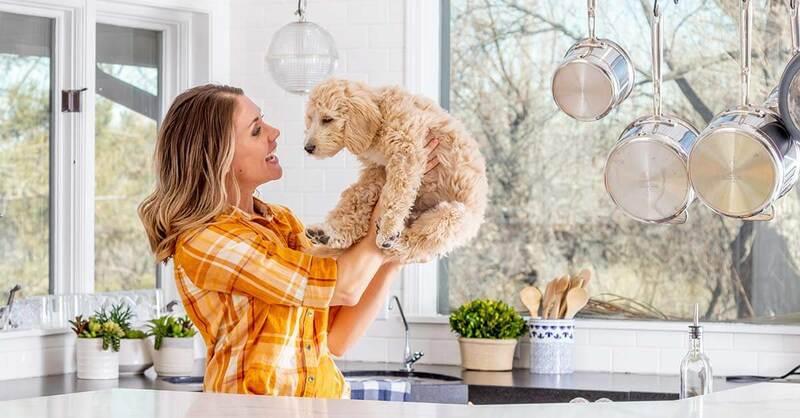 This allows you to determine how your dog will react to the aroma permeating the air. Remember, your dog is so much more sensitive to scents than you are and a little bit goes a long way! We recommend that you diffuse in a well-ventilated area that your dog is able to leave if he or she wants to. Avoid continuous diffusion and do not place diffusers directly on a dog’s crate if they are locked inside. If you notice any kind of negative reaction, immediately discontinue use and lead your dog to some nice, fresh air. If you’d like to try passive diffusion techniques, your dog may enjoy the Paw Pal Diffuser. Adding a drop of an accepted essential oil or blend on a cotton ball and tucking that under the cover of your dog’s bed may also be well tolerated. Please note that when using passive diffusion we recommend diluting the EO as if you were applying topically. Do not use undiluted essential oils near your dog. How to use EOs topically on your dog. To help support issues such as skin conditions and tummy troubles, topical application may be very helpful! Apply the accepted essential oil or blend to the areas suggested below related to the area of concern. Ideally, apply the diluted blend while doing an activity your dog enjoys. Each dog is different, but a few suggestions include applying it during massage applications, while cuddling, or even when giving them their favorite treat. Positive reinforcement is critical to the success of using EOs with dogs. Never apply directly to the mouth, whiskers, nose, nostrils, ears, eyes, or sensitive genital areas. We recommend our Pup & Pony Blends, which include only safe essential oils. 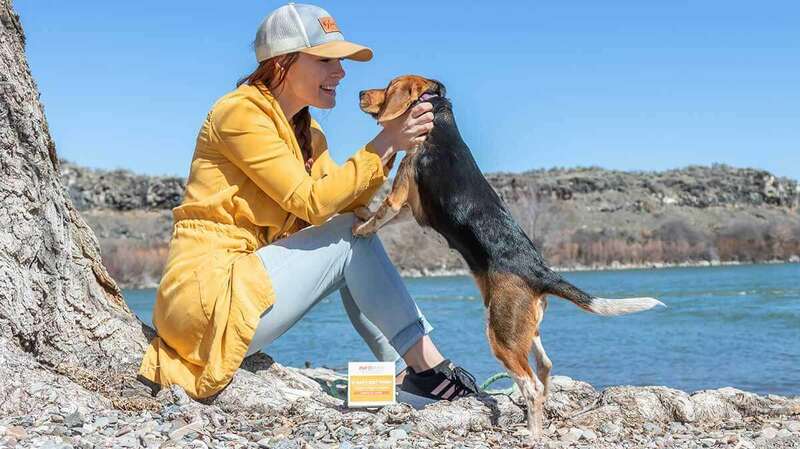 These were carefully formulated with your pup in mind and cover a wide variety of both physical and emotional issues. Safe single oils include Cedarwood (all varieties), Chamomile (all varieties), Eucalyptus Globulus & Radiata, Frankincense (all varieties), Lavender, Mandarin, Palmarosa, Sweet Orange, Sandalwood (all varieties), and Vetiver. Essential oils to avoid include Anise, Blue Tansy, Camphor, Clove, Garlic, Oregano, Tea Tree, Wintergreen, and Yarrow. Confusing the word “natural” with “safe” can be a dangerous assumption. Yes, essential oils are wonderful, natural products that can support humans and dogs in all kinds of ways, but they must be used responsibly. They can pose serious health risks for dogs if used without care. Since the chemicals that make up essential oils are metabolized through the liver, we recommend that your dog be more than 10 weeks old and of generally good health before introducing essential oils. Please talk with a veterinarian immediately if you suspect any health concerns after using essential oils. I am so excited PT has ventured into the pet side of oils! I feel very confident in using any of the new products on my dog because I know PT has my dogs safety as a priority. Thank you PT! I am so excited about your pup and pony line! I’ve done some of my own research, but I’m not an aromatherapist, and it can be tedious work. So grateful for the great people at PT looking out for our puppers! Thank you for listing the “safe” and “avoid” oils!! 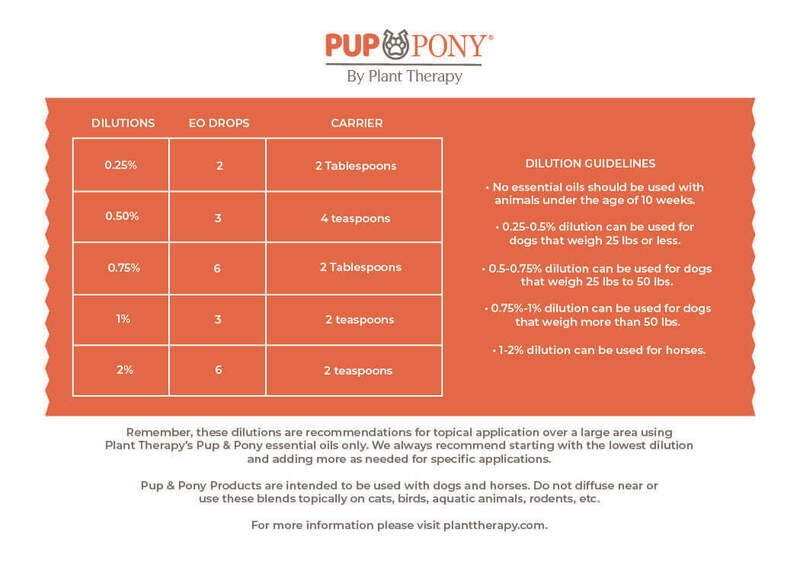 This really helped in choosing oils for myself, so I know I’m not inadvertently hurting my pups! Very useful information. Thank you so much for doing this for our animals and for us. I mainly want to use oils for myself, but I am scared to diffuse unless it is safe for my dog’s. Now I can feel more confident in what I can and cannot use. I actually think the K-9 blend sounds really good for ME I might just have to buy it. We have our daughter’s dog in our home frequently so this is very useful information. Thank you for sharing. This is great information. I’ve always been very careful around my dog, this is so helpful! Is there a carrier oil that’s most recommended to use to dilute oils for my dogs? Are there any carrier oils to avoid using on dogs? Kelly, please reach out to our certified animal aromatherapists at [email protected] for concerns not covered in this blog. Thank you! This information is GOLD!! Saving all this info and downloading the graphs, as we love our pups and I looooove the felt necklace for dogs!!!! So many new abs great tempting doggy offers. Thanks a bunch PT!! Thanks for the information! Very informative, very interesting. There is nothing I wouldn’t do for my dogs! I am excited to purchase this set for when they need it. Thank you PT! I am really excited that PT is including blends for pet’s! It takes the guess work out of it for me and I feel much safer using it on my beloved Frankie. Thank you Plant Therapy! This is awesome!!! My Granddaughter’s dog suffers from separation anxiety. Some of these doggie safe oils can also be used to calm my over active grandson as well. This is certainly a win-win situation. Thanks again Plant Therapy for all you do! Wondering about lemon and peppermint since I don’t see them on either list, but I do see them as ingredients in your pup and pony line. I love to diffuse those two (with lavender) for allergies for my kids. I haven’t done it since we got the dog (a year ago.) Of course, I know I can do it in the kids’ rooms where the dog does not go, but am curious if either of those single oils are safe. I am so happy that this new line even exists. Beyond the Pup & Pony line, though, I am very thankful for the comprehensive list of PT safe singles and synergies AND for the DO NOT use list. I am routinely concerned about my personal use of oils affecting my little companion. These lists help clear up some of the contradicting information I’ve found from other resources. Where should I look to see if OOTMs are dog safe? Will it indicate on the product sheets moving forward? SO excited for all of this information, and so thankful for the peace of mind that I now have knowing what is safe around my dogs! Thank you so much, Plant Therapy!! The Paw Balm makes so much sense! I live in the desert and dog paws get hot. This will be amazing for them. I am very excited to be able to use essential oils for my dogs. Thank you for the information regarding dogs and how to introduce essential oils to them. I think the Paw Balm will be my first purchase. This is such great information. I can’t wait to test out some of the tips! Thank you so much for this! Learning a lot and it makes me all the more excited to try the new line. Very informative! My husband and I don’t have pets but we have grand-pups and now I can confidently create blends for them (or order them from PT)! This is great info. Thank you for researching and teaching us how to use our oils with our furbabies. WOW! What a ton of great information! My husband and I just got a puppy a few weeks ago so I will be trying the new line of dog oils once the little one gets old enough. Thanks! What a great idea! I never really even thought of essential oils for my pets (other than flea issues). Thanks for thinking of the whole family! Thank you for this line and all this wonderful information. When wanting to use with a dog that is on daily medication are there precautions that should be taken, best to avoid all together? Any guidance? thanks! Thank you for all this great information. Can’t wait to try Confident K9 for my anxious 7 year old lab. I hope you come out with something for calming hyperactive dogs. My 9.5 year old lab is still mistaken for a puppy, he has not slowed down a bit with age. WHOA! That was a great article. I never would have thought to oils and pets would go together. I have a VERY nervous dog and when I diffuse Relax or Lavender, he is much more calm. I like the idea of paw balm. I can’t wait to try that. Thank you Plant Therapy for always expanding your line to make pets and humans lives much easier. There’s a lot of great information here, thanks for that. I have purchased commercial tea tree oil spray (with chamomile and other ingredients) for skin issues, like hot spots. It’s been wonderful for his skin. He has an autoimmune disorder, which causes skin and nail issues, so I’ve used it quite a bit, over years. I’ve wanted to make my own version of it. Why do you say TTO isn’t good for use with dogs? Alex, studies have shown TTO causing severe toxicity reactions in dogs, and if there is any concern with an oil and your pet, we just don’t recommend it. Please reach out to our Customer Service Team at [email protected] for more information and they will redirect your question to our specialized animal aromatherapists 🙂 Thank you! May I know whether geranium eygptian is safe for dogs? Thank you for writing this! I feel like there are many people out there who do not realize that dogs can respond differently to oils. This is such important information to know! Very excited to try this new line with my dogs! They get such bad anxiety!! Thank you for this information! It is very helpful and I’m excited to try this with my labradane!! I have been waiting for this info for so long! So happy you guys are doing this! Great — thank you PT! Are there any resources for cats coming out? Love seeing this line of products, hopefully a magnet is in the plans so we have it handy for dilution like the other magnets. I have been waiting for this!!! I use essential oils for my dogs anxiety and allergies. We only diffuse because I gathered a very tiny list of safe oils from our vet and a recommended book. I am so happy PT came out with this information and line because it is 100% reliable! Now I can use a lot of my oil collection around my dogs without worrying. I’m so excited for this line. I use essential oils on my dogs under the care of a vet and have seen great results. Can’t wait to try the calming blend. Hoping there are more mixes in the works! I really appreciate Plant Therapy opening the dialogue about safe use of oils around dogs. I’ve always assumed that if I was being careful to diffuse kid-safe oils, it was probably safe for my pet- but I feel much better having more specific guidance. Thank you! I’m thrilled that Plant Therapy is researching this important topic and I know I’m not alone. So many of us with household pets worry about the effect our essential oils have on them and, with so much incorrect/misguided information out there, it’s hard to know what to believe. I will lap up all of the information you can give. Thanks again, Plant Therapy, for all of the researching you do! This was very helpful info. I would like to try this. This is information is so helpful. I am very glad to have a reliable source to help with me precious pups. Thank you for all this information, that I know is from a trusted and reliable source. I’m so excited to try these products. My puppy sure could use some Happy Trails. It’s a challenge getting her to the vet! Love this new line! I have witnessed how essential oils help dogs with a variety of issues and I love how much information there is in this post! I’m so excited to try these out. Very helpful info! I’ll be teaching a class on EO’s and this will come in handy!